WHAMOBASS 2018 is scheduled for October 20-21, 2018 in Coalinga, CA. Pictures from WHAMOBASS. Use the navigation in the bottom right corner to flip through photos from previous years. The "Whiskey Hill Atherton Menlo Oaks Ballooning And Sporting Society" was founded in 1965 in Menlo Oaks, (Menlo Park) California by balloonist Deke Sonnichsen. Deke tells of his thoughts about why he started this event. "I wanted to honor the first aeronauts and share art of aerostation without commercial competition." 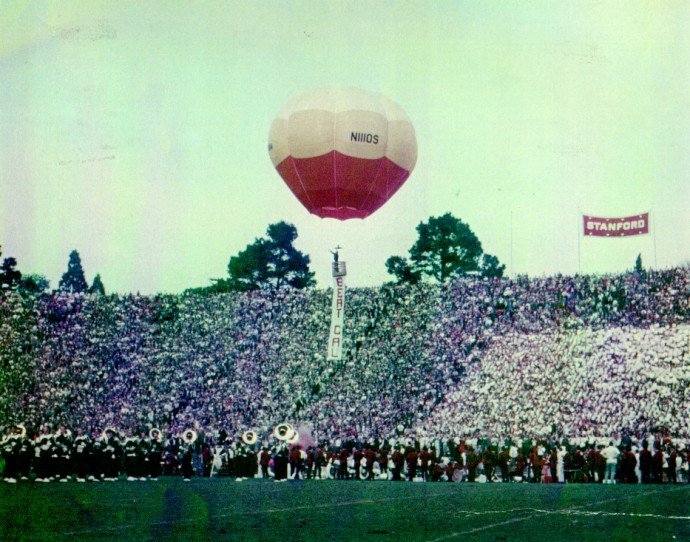 The announcement for the first meeting of WHAMOBASS occurred over the public address system at half time of the Cal-Stanford football game in Stanford Stadium on 20 November 1965. Sonnichsen then flew his balloon LIBRA from the floor of the stadium, landing outside the stadium on Nelson Road at Sam McDonald Lane. The first WHAMOBASS Balloon Rally occurred the next day, 21 November, at the Hannes Schroll (Dorsey) estate in Whiskey Hill (Woodside) with one balloon (of the fewer than 15 hot air balloons that then existed worldwide...all in the U.S.). The flights and rally were covered and reported in the Palo Alto Times and Sunday San Francisco Examiner. The second rally was held in 1966, in Atherton, with two balloons attending. The third rally was held in 1967 in Menlo Oaks (Menlo Park) with three balloons. All three events were in November, close to or on the 21st. 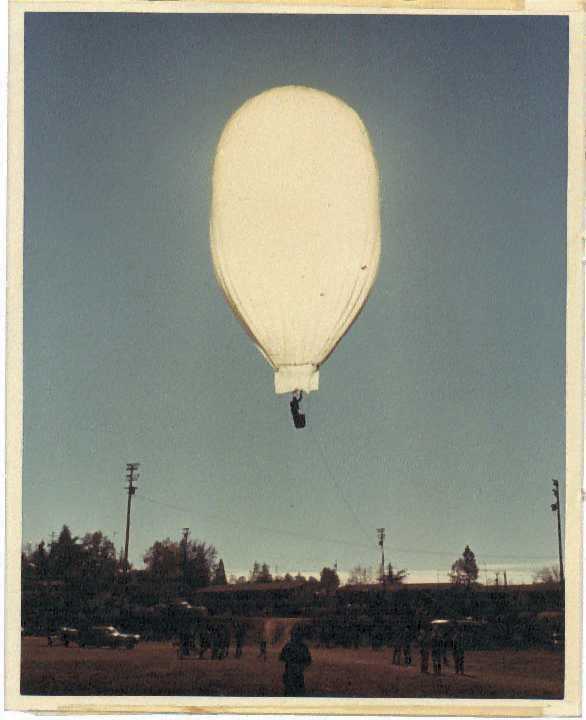 The fourth rally, 1968-69, was an experimental, year-end event in Tracy with four balloons, as was the 1969-70 rally held in Volcano and San Gregorio with seven balloons. In 1970 the annual rally returned to the weekend on or near 21 November. Coordinating a new site each year was becoming an increasing chore. In 1970 the rally was in Los Olivos, in 1971 in Mariposa and in 1972 in Sonora and Columbia. Coaling Station A was chosen first in 1973. After 1974 in Morgan Hill and 1975 in Salinas, Coalinga then alternated with San Miguel for four years. In 1979, Coalinga was finally selected as "home" site due to the welcome and accommodations from West Hills College President Bob Annand and staff, from Art Dakessian of the Cambridge Inn, and also due to the gracious, matchless hospitality of Hugh and Claudia Vierhus. The central California location plus fine flying weather in Pleasant Valley, and the very friendly local residents were all important factors which influenced the Rally Committee to adopt Coaling Station A as its annual meeting location. In the 60s and 70s were the wild and wooly days of ballooning. WHAMOBASS has welcomed a wide variety of UFOs (Unique Flying Obsessions). Aeronauts have brought some strange and wonderful balloons. Why - This event celebrates the anniversary of the first documented flight of a manned free balloon (hot air), which occurred on 21 November 1783 in France. The balloon was designed and built by the Montgolfier brothers and piloted by Pilâtre de Rozier and the Marquis D'Arlandes. This epic first flight originated from the Revillon's La Muette garden in the Bois de Boulogne, Paris, France. WHAMOBASS is a unique event. In addition to celebrating man's first hot-air balloon flight, it allows the participants to share in the enjoyment of the art of aerostation, without the commercial pressures and competition typical of traditional balloon rallies. When - WHAMOBASS is held every year on the November weekend closest to the November 21st anniversary. The next WHAMOBASS will be November 20-21, 2010. Where - WHAMOBASS now takes place in Coalinga, California (Coaling Station A), a small community in south Fresno County. The balloons take off (weather permitting) from West Hills College. Though this event has been held at other locations it is our 31st year at Coalinga! Who - The WHAMOBASS rally was founded by Deke Sonnichsen, who sponsored the balloon event until 2000 (see History of WHAMOBASS). The event is now sponsored and administered by the Pacific Coast Aeronauts (PCA). The event is by invitation. If you are a PCA member, you are invited (see Joining the PCA). It's fun - WHAMOBASS has customs and traditions befitting its unique character and characters. These include, unusual aerostatic displays, humorous performances, and some really interesting acoustic openings to pilot's briefings. It's safe - This is a fun event, however safety is taken very seriously and the rally maintains a perfect, injury-free safety record for the past thirty eight (38) years. It's delicious - Gravity management is an important part of ballooning and WHAMOBASS features fine vittles ranging from Pixie's burrito breakfast to a sumptuous barbeque by Fred Sweeny of Arroyo Grande (see WHAMOBASS 2001 Odyssey). It's historic - WHAMOBASS, in 2006, in its forty second (42) year, holds the distinction of being the longest continuing balloon event in world history...longer than the James Gordon Bennett Balloon Race and seven or eights years more senior than Albuquerque! It's small - By inviting one or two new, known experienced pilots and balloons each year, the rally has been kept to a manageable size, near fifty (50) balloons, in an educational, low key, fun environment, for the enjoyment of the participant pilots and crews and the townsfolk. It's non-competitive, yet there are awards! The Bone-&-Barbed-Wire-Award for most inaccessible landing (retired in the early 70's when people started to compete for it) on display at the Cambridge Inn lobby. The WHAMOBASS Seismic Award in acknowledgment of the 1983 Coalinga Earthquake, on the 200th Anniversary of Ballooning, given for the best written entry by pilot & crew about a specific aspect of their flight. The Chief Judge Traveling Cup awarded to each Chief Judge, whose name is engraved thereon. (See WHAMOBASS Chief Judges). Where can I see photos from past WHAMOBASS events?